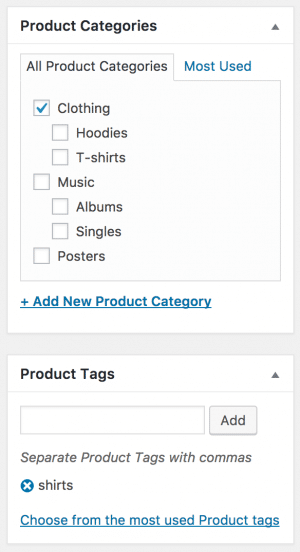 You can add new products through Products → Add Product in the WordPress Administration Panel. Products contain most of the same options as standard posts. You can read about these in the Add New Post chapter. Additionally, they contain post options specific to products. The Product Data meta box is where the majority of important data is added for your products. Product Data is added in this panel, found below the post content. SKU: Stock keep unit (SKU) tracks products. Must be unique and should be formatted so it does not match any post IDs. For example, post IDs are numbers so a SKU could be WS01. That could stand for WooShirt 01. Regular Price: Item’s normal/regular price. Sale Price: Item’s discounted price that can then be scheduled for certain date ranges. The inventory section allows you to manage stock for the product individually and define whether to allow back orders and more. If stock management is disabled from the settings page, only the Manage stock? option is visible. The Inventory section of the Product Data metabox. Ticking the Sold Individually checkbox limits the product to one per order. Weight: Weight of the item. Dimensions: Length, width and height for the item. Shipping Class: Shipping classes are used by certain shipping methods to group similar products. Using up-sells and cross-sells, you can cross promote your products. They can be added by searching for a particular product and selecting the product from the dropdown list. After adding, Linked Products are displayed in the input field. The Linked Products section of the Product Data metabox. Up-sells displayed in the front end of the site. Cross-sells are products that are displayed with the cart and related to the user’s cart contents. As an example, if the user adds a Nintendo DS to their cart, you may want to suggest they purchase a spare stylus when they arrive at the cart page. Grouping: Used to make a product part of a grouped product. More info in the Grouped Products chapter of the WooCommerce documentation. 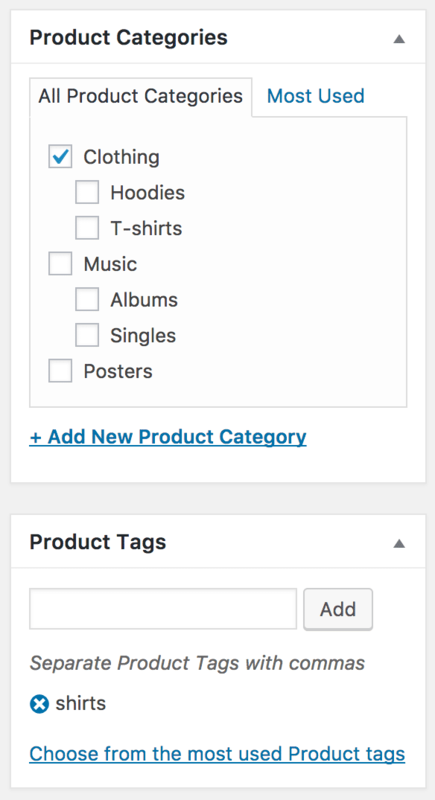 On the Attributes tab, you can assign details to a product. You will see a select box containing global attribute sets you created (e.g., platform). 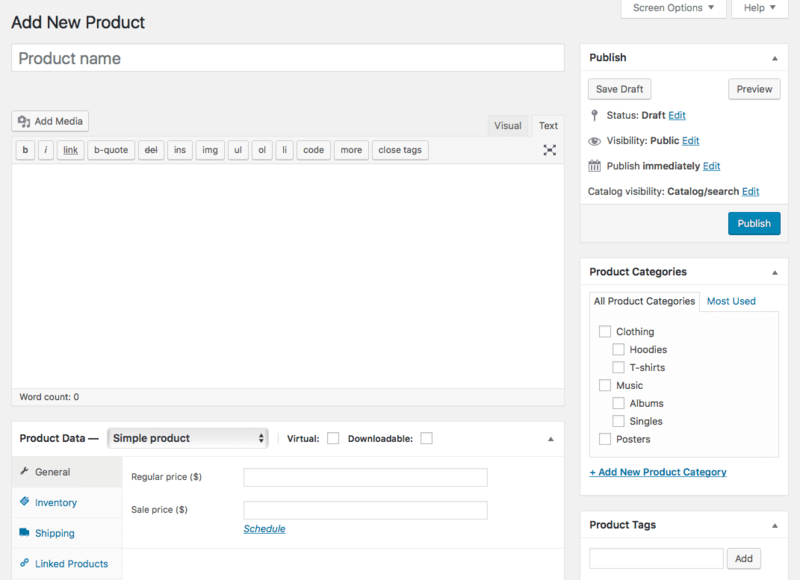 More in the Managing Product Categories, Tags and Attributes chapter of the WooCommerce documentation. Once you have chosen an attribute from the select box, click add and apply the terms attached to that attribute (e.g., Nintendo DS) to the product. You can hide the attribute on the frontend by leaving the Visible checkbox unticked. Custom attributes can also be applied by choosing Custom product attribute from the select box. These are added at the product level and won’t be available in layered navigation or other products. Purchase note: Enter an optional note to send the customer after they purchase the product. Menu order: Custom ordering position for this item. Enable Reviews: Enable/Disable customers reviews for this item. Add a short product description. This typically appears next to product imagery on the listing page, and the long description appears in the Product Description tab. 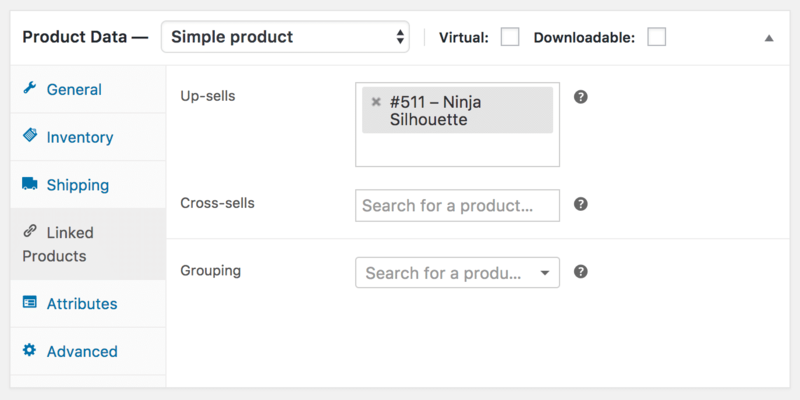 On the right-hand side of the Add New Product panel, there are product categories in which you can place your product, similar to a standard WordPress post. You can also assign product tags in the same way. Product Categories and Product Tags, in the sidebar of the Add Product page. You can add a main image and a gallery of images. 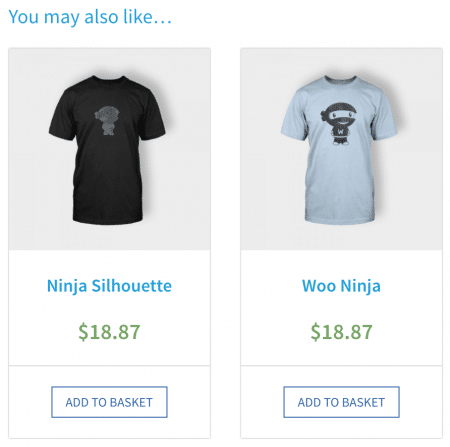 More in the Adding product image and galleries chapter of the WooCommerce documentation. Additional WooCommerce options in the Publish box. 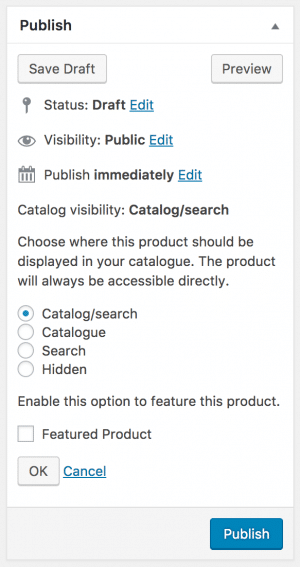 Catalog and search: Visible everywhere, shop pages, category pages and search results. Catalog: Visible in shop pages and category pages, but not search results. Search: Visible in search results, but not in the shop page or category pages. Hidden: Only visible on the single product page – not on any other pages. You can also tick the Featured Product box, to make this product visible in areas where such products are displayed, such as widgets etc.